The Triton Workcentre 2000 was launched back in about 1997 or 98 or so (sure someone can confirm more accurately). I used to have a poster of the Triton timeline that’d confirm some of the dates. The name was somewhat unfortunate in hindsight. Having the product named for the millennium meant it became increasingly obvious how old the design was, with people in 2002, 2003 and on wondering if they should buy the 2000, or if another was being released soon. Funny thing is, a new design was on the drawing board at the time, but the decision to develop the new version beyond the blueprint phase was delayed and cancelled by successive owners of the Triton brand. The design had an extruded aluminium top, a full mitre slot, and drop-in induction motors. 1 1/2 decades later, and that design has finally been dusted off, revamped, developed, then turned into a new product – the latest version of the Triton Workcentre, the WX7. 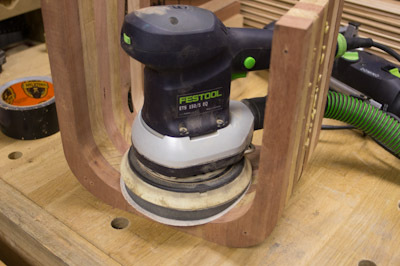 There is also a full redevelopment of the Router Table, and an impressive new version has been produced. Due to the market early 2015. 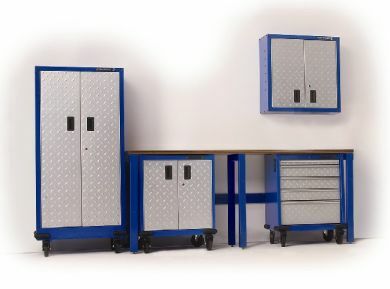 There are 20V 4AH system tools, including a drill/driver, a combo hammer drill and a 160Nm Impact Driver. 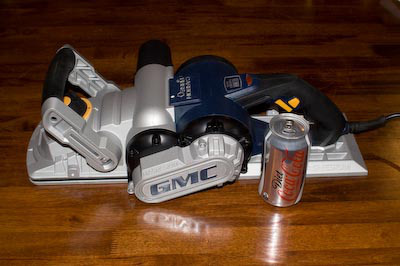 Alongside a reciprocating saw, right angle drill, oscillating multi tool, and a geared eccentric orbit sander. Some of the other products already available are strangely familiar. 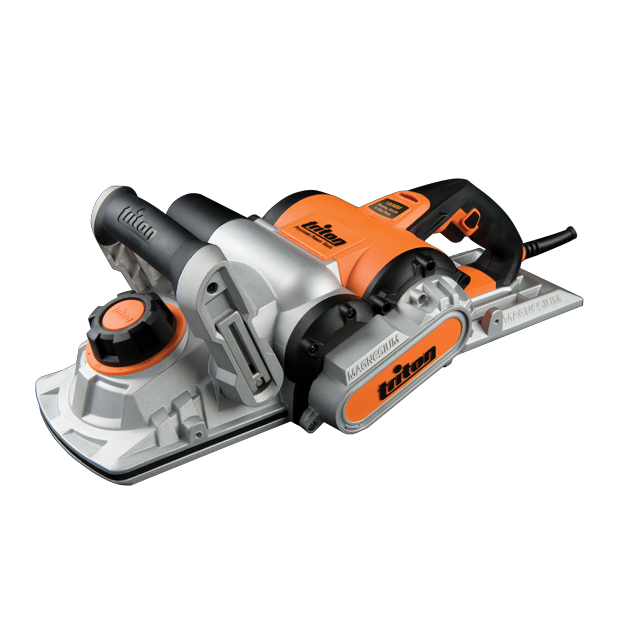 Such as the 180mm power planer. 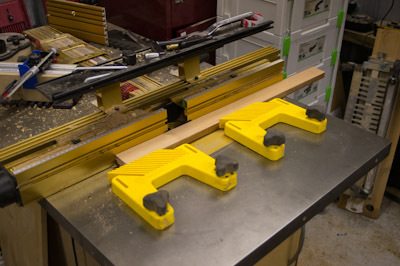 (And the unlimited rebate planer). Could it be that I have seen it back in August 2008, and still have it sitting in my workshop, coloured blue, but with GMC on the side? Even down to the “magnesium” embossed signage on the side cover and base plate. They still cannot seem to escape that unfortunate association with GMC. 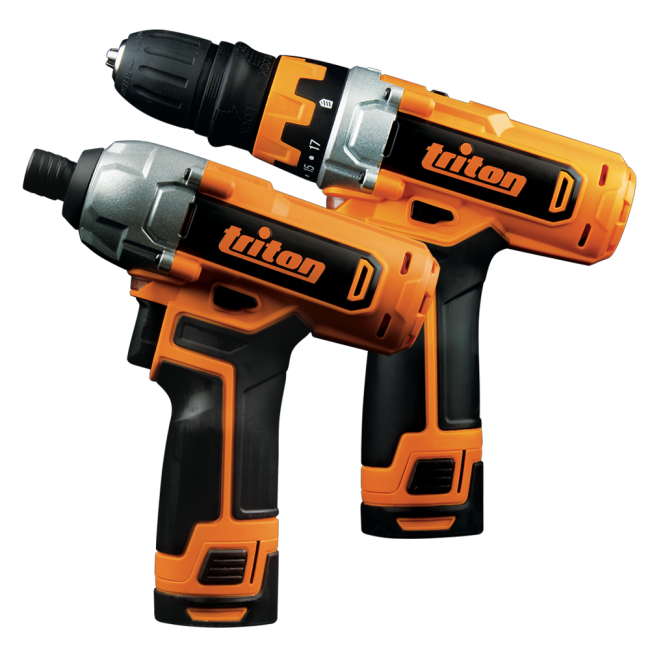 The T12 drill also bothers me – the Triton drill had one really unique feature that stood it out from the crowd – the plunge mechanism built into the drill. And despite a strange look, that was the best feature of the drill, which after all is one of dozens on the market. The T12 has done away with that. 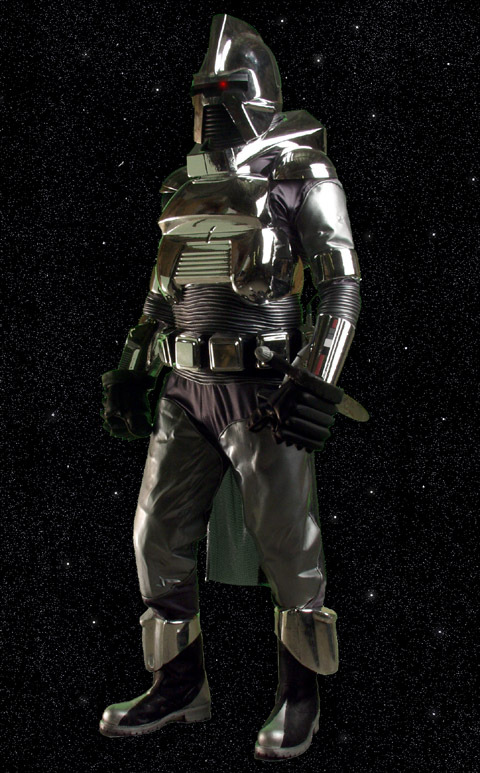 The 20V version has a bigger battery, and also follows the Hitachi design concept – if you don’t think it would look out of place in the hands of a Cylon Centurion, you are on the right track. Interesting idea. Not a design route I’d choose personally, either for tools I was designing, or ones I was planning to add to my workshop, but to each his own. 1. Get the mobile base from under the previous tablesaw (that was a bit of a mission in itself, being over 200kg, and in restricted space in the garage). 3. Set up, and film the first stage of the SawStop setup, up to the point that the saw is out of the box, upright and sitting on the mobile base. I’ll continue the process when I have more time to dedicate to it. 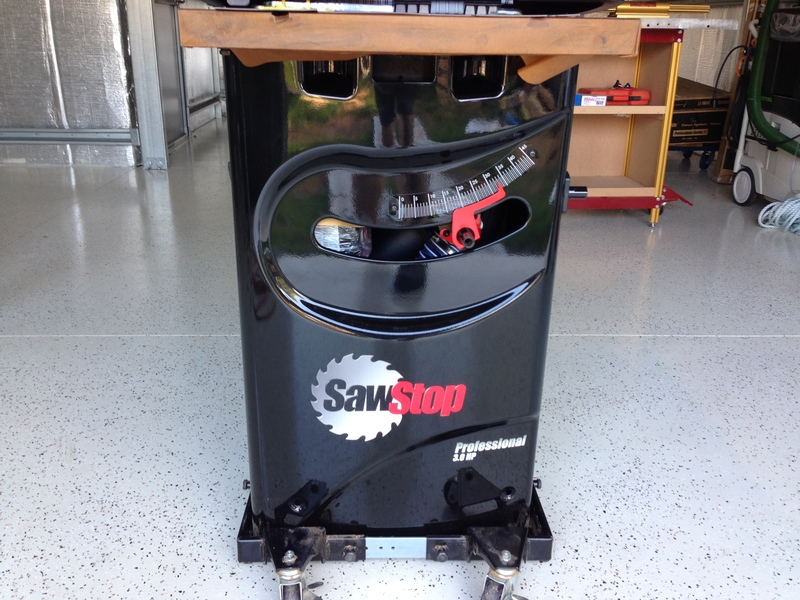 At least the saw is now mobile, and it sure looks good – black is definitely the new black where it comes to workshop machinery! 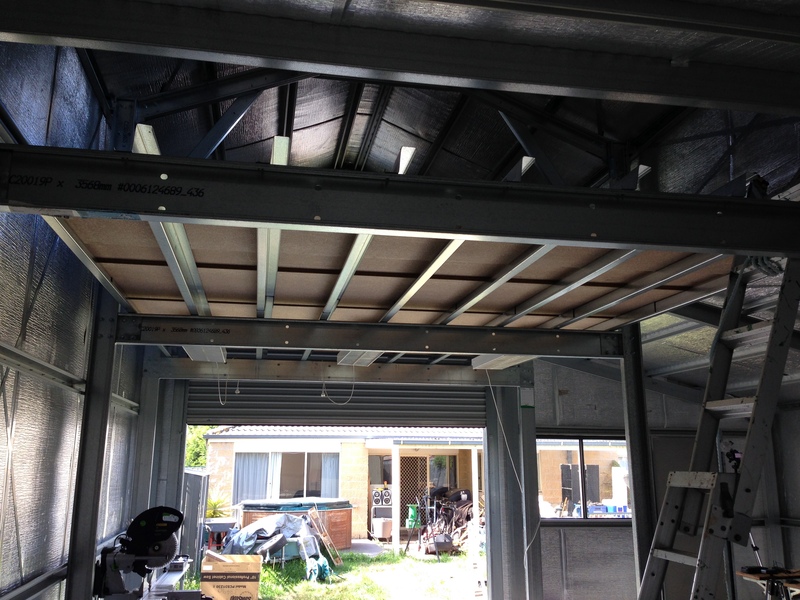 Next, I decided removing a couple of purlins would make life a lot easier, so off they came. 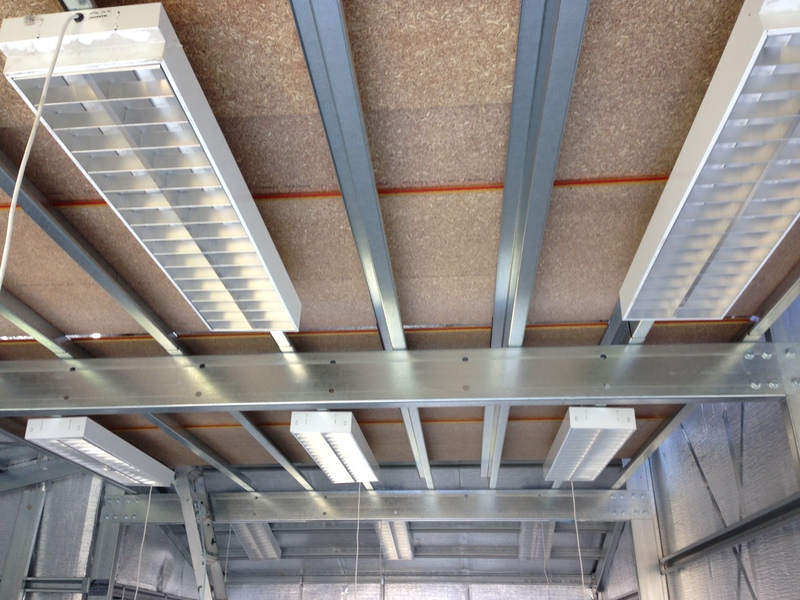 The benefit of a steel structure, held together with heavy-duty screws. I managed to get the sheets up there – bit of a combination of angles, rope, and brute force. With the mezzanine at 2800, it was a bit of an effort even so. The sheets are only 33kg each, just cumbersome. At the moment they are only sitting up there – I will fix them down later once the final building permit is signed off, and then the attic stairs installed. They look raw underneath, but I have a solution to that. This was the first chance to see what the shed looks like with the overall vertical view blocked, and it is fine – not too closed in. Benefit of having a high ceiling. I still haven’t decided whether to run the floor right to the edges (which needs more than the 3600 length the redtongue comes in), or to stick with the current length and secure it down. Decision for another day. This is what I’ve bought to lay down under the flooring, so it looks the business from the ground. Has some minor insulating properties, but I got it because it looks like the existing insulation on the walls, and is a good reflector, maximising available light in the shed. Speaking of lights, this is how I am installing them on my own. A MagSquare. And specifically the 50mm. 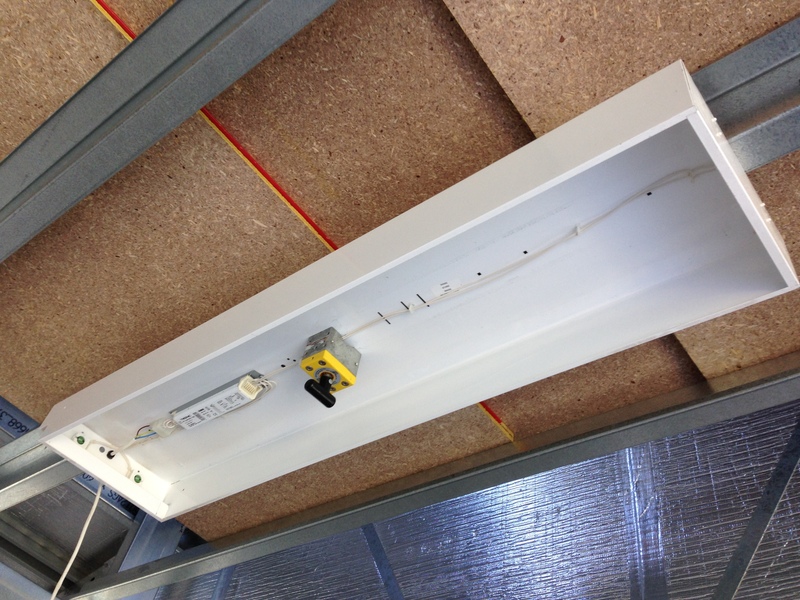 It comfortably holds the light fitting in place until I can get the self-tappers in. With the main and rear sections done, it looks pretty good. All in line, spacing about right. Double tubes per fitting should make for plenty of light. Each fitting has a standard 3 pin plug end (which is the flex you can see hanging down), so wiring them in will be easy. 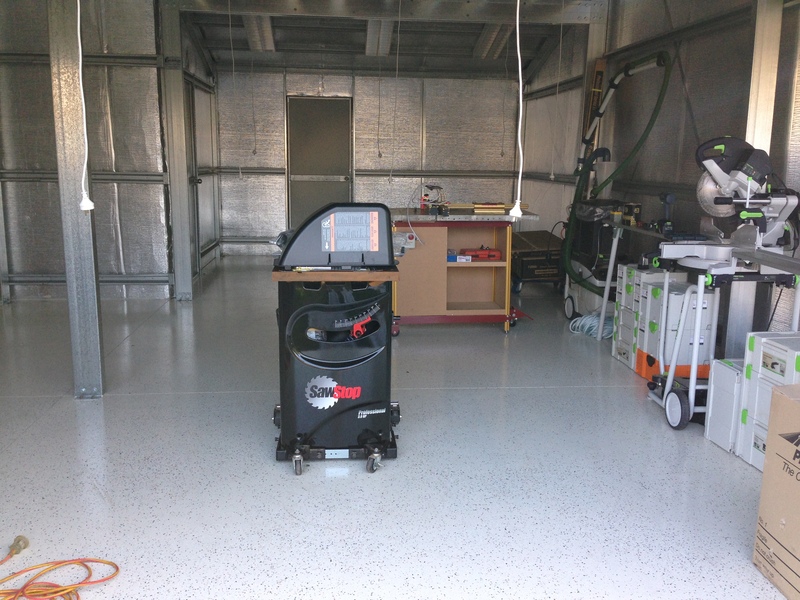 Not looking as wide as it will when fully assembled, but there is a real presence in the workshop….. 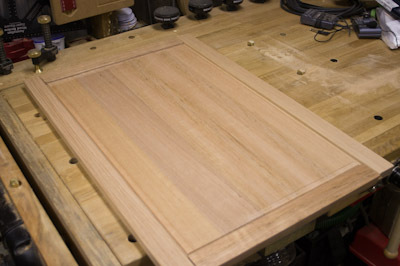 The router table has always been particularly good for cutting a groove, particularly in smaller items (such as making boxes). The orientation of the blade to the timber for one, the diameter of the blade (vs a tablesaw), the speed of the cutter, the accuracy in setup. The one frustration I have found is having to accept the width of the groove is limited to the width of the cutter of the router bit, or having to take multiple passes. 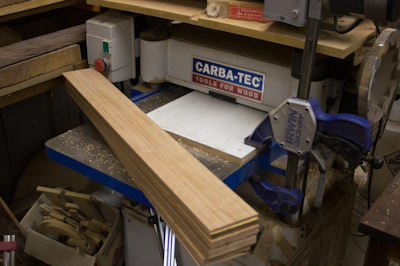 Unlike a tablesaw, the concept of a dado blade is foreign to the router table. Well until now that is. 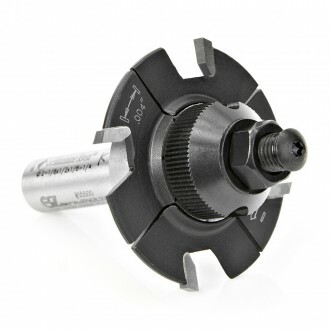 Toolstoday.com have available a really interesting router bit indeed from Amana Tool. 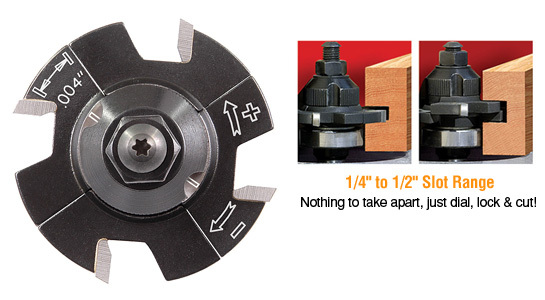 It is an EZ Dial Slot Cutter, and unlike a tablesaw dado blade stack, this router bit does not have shims, or even need to be taken apart and reassembled. Looking at the anatomy of the router bit, from the top-down. The top threaded section is the range of adjustment of the router bit, and there are two types available – a 1/8″ – 1/4″, and a 1/4″ – 1/2″. Next is the locking nut – once the width of the slot is set. The knurled knob is the adjustment for the router bit, and is then locked in position with the locking nut. The blade is next – it is a four-flute router bit, but because of the adjustment, each side of the trench is cut with two of the flutes. As the knurled adjustment knob is turned, two of the flutes move with the knob, and the other two remain fixed. 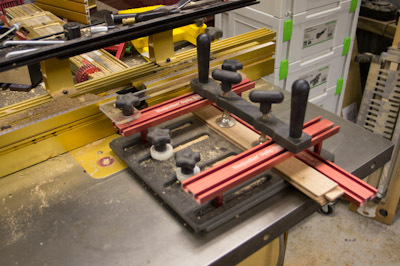 A bearing then sits under the flutes – useful when following curves, and other times a router fence is not in use. Just below that is a section with two flats – this is useful if the locking nut is too tight – a spanner can be fit on this section so it can be undone without having to risk damage to the router chuck or shaft lock. 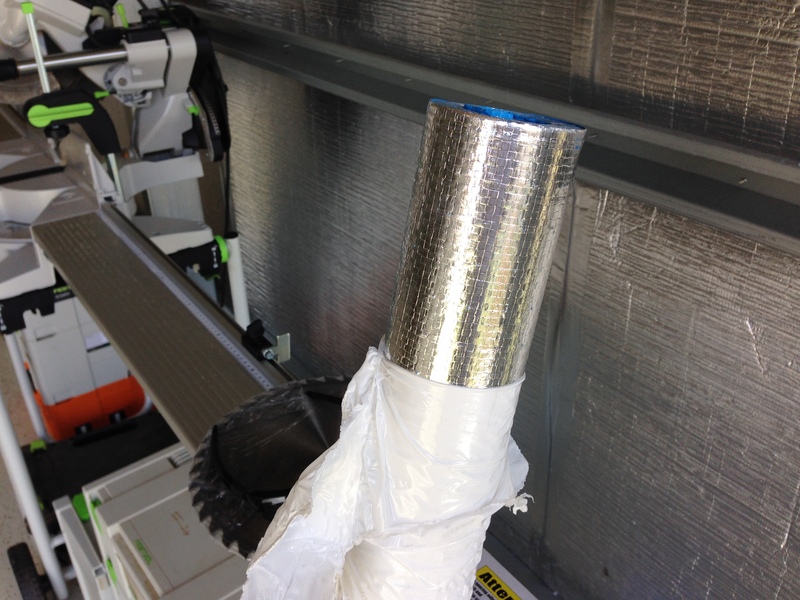 Finally, the shaft is a finely finished, accurate 1/2″ shaft. (An inaccurate shaft is either difficult to fit the router collet if too large, or at risk of slipping if too small). 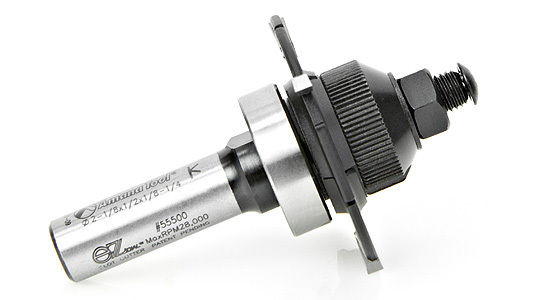 I was working with the 1/8-1/4″ router bit, but the concept is the same. In the above image, the two opposite flutes move, the other two are fixed. That dial-in adjustment is remarkably liberating. 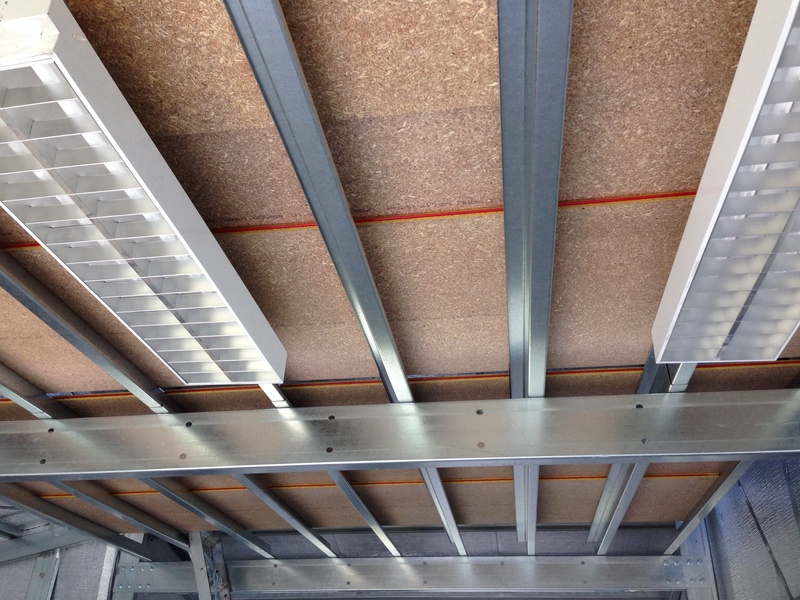 Being able to set the width of the resulting slot to accurately match the material that will fit in it (whether that be another piece of timber, a sheet of glass etc), and also easy to add an accurate amount of clearance if required. The quality of the router bit is obvious, as is the finish that is achieved. Not only can the width of the slot be set, but it can be adjusted with the router bit fixed in the router. (So long as you intend to remove more material – too hard to put material back!) Rather than trying to work out the range to move the router up and down again, a test cut or two, a dial-in of width, and your accuracy and flexibility of the table is increased dramatically. 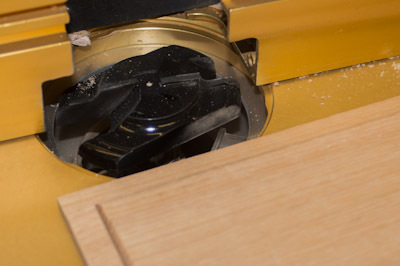 Once you experience the convenience of a shim-less, dial in width of slot for a router bit, you’ll be wishing a tablesaw dado blade was as easy, as infinitely adjustable, and as accurate. 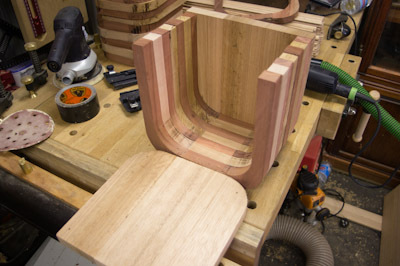 Once the initial parts for the sink were glued up (the large U shape sections), it was time to make the actual components. Ideally, I wouldn’t have had to take the previous step, but I am working with a limited stock size, partly as a bit of an exercise, partly because I have the timber, and don’t feel like buying something else. The redgum is being salvaged from the ugliest, oldest sleeper you would have seen in a long time. Always surprising just how much good timber is hidden behind a rough façade. 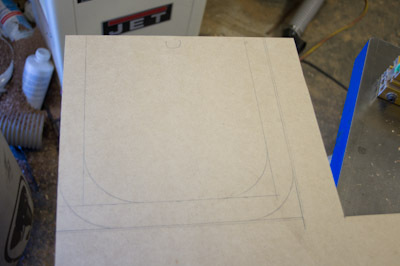 To cut the individual sections out, I created a template from MDF. It is easy to draw up and shape to the required profile. In this case, I didn’t have to worry about screw holes, so it was easier and less problematic to use screws (Kreg square drive). You may wonder about the amount of timber wasted here inside the sink. It won’t be going to waste, as I intend to use this again in the same way to produce some other (as yet undecided) kitchen appliances. 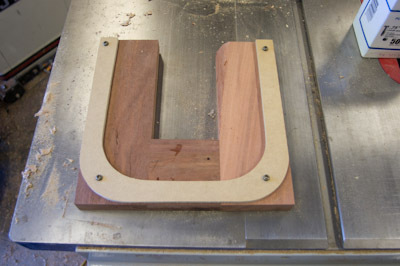 To remove the bulk of the material, the bandsaw works exceptionally well. 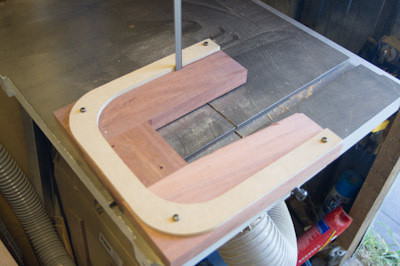 Cutting near to the template reduces the load on the pattern copying router bit. 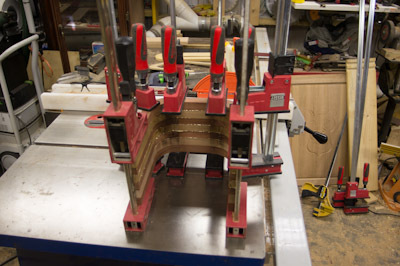 Next, each piece is glued and clamped together to form the body of the sink. 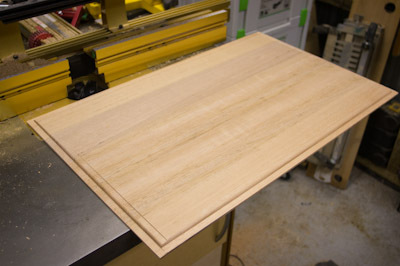 The ends have also been cut using the same template, but obviously only the outside is cut and routed. 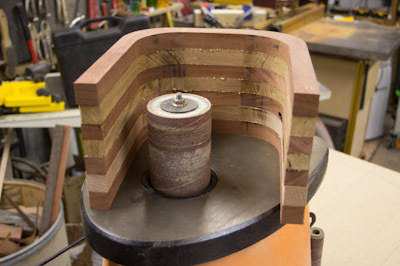 The spindle sander is next, and is the perfect tool for this job. It may not get the full depth, but flipping the workpiece over a few times keeps things pretty even. 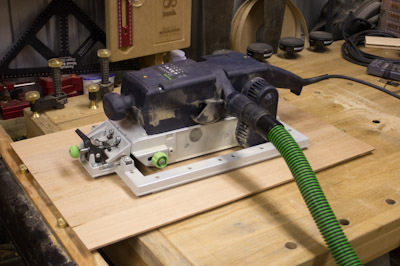 The size of the sink just allowed me to get the ETS150 inside, but it isn’t ideal for sanding around corners…..except I have a soft sanding pad (from Ideal Tools). This has hooks on one side, and loops on the other, so it acts as a spacer between the original sanding pad and the sandpaper. 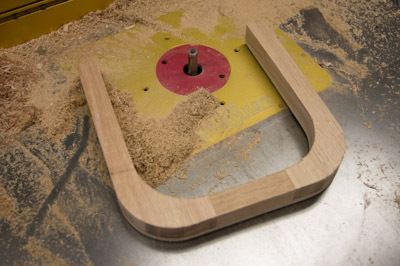 With this, it is really easy to sand all sorts of concave and convex profiles. 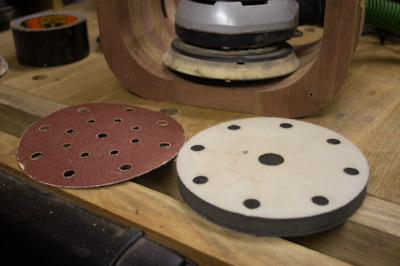 This is the soft sanding pad – a very useful addition for the ROS. 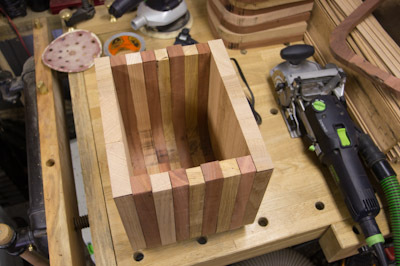 With the inside done, the sides of the sink can be attached. This (and the next image) were actually photographed before the glueup, but it gives you the idea. So that is how I make the laminated sink, still ensuring that the entire project can be made from timber. Not sure if I will be able to maintain that ideal for the entire project, but I am still working towards it. Very pleased I used contrasting timber this time – might as well make a feature of the laminations! 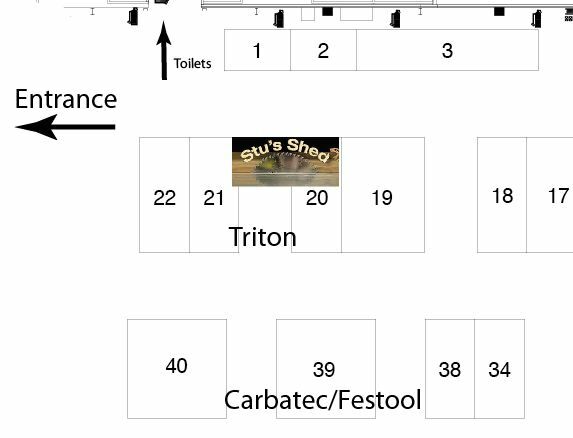 Zooming in on the plan, and right near the entrance is Triton’s stand (#20 & #21), and as part of that is Stu’s Shed (and thanks to Triton (aka Kincrome) for use of part of their stand). Now I’ve a better idea of the location and size, I’ll make some modifications to my ideas – scale back some concepts! Not a bad thing – it is very easy to try to do too much – grandiose plans!